Underground electrical conduits allow homeowners to extend their electrical supply to sheds, barns, or other structures on the property safely, without unsightly overhead wires. Our Resolve Trenchless technologies allow this to be done without digging unsightly trenches all over your property. If you live in the surrounding Warminster area and you need electricity extended from your home to other parts of your property or you need your electrical conduit replaced, call the trenchless experts at Resolve Trenchless. We have years of professional experience installing electrical conduit using trenchless technologies and would be glad to help design a custom solution for your property. Contact us today to speak with one of our qualified trenchless specialists. Electrical conduits are made from a number of materials, giving you a wide range of options for your wiring job. Flexible conduit is a good option in narrow or oddly shaped spaces where a rigid conduit won’t fit. A flexible conduit is easier to work with and can be easily bent to meet the demands of the space. A rigid conduit of plastic or metal is significantly less flexible, but provides a greater degree of protection against moisture and other potentially damaging elements. Rigid conduit materials can be shaped to a degree, but are not nearly as easy to manipulate as flexible materials, and therefore they don’t work as well in tight spaces. Before installing an electrical conduit, be aware that there are risks involved. Wiring is a tricky and potentially dangerous task which can cause injury if done improperly. For most electrical work it is recommended you call a professional, not only for the sake of safety but also to ensure the job is done properly. The best course of action when considering an electrical conduit is to call a professional like the trenchless technicians at Resolve Trenchless. We have years of experience installing underground electrical conduits in the Warminster area. We’d be glad to discuss your options with you and help you put together a plan for your electrical project. 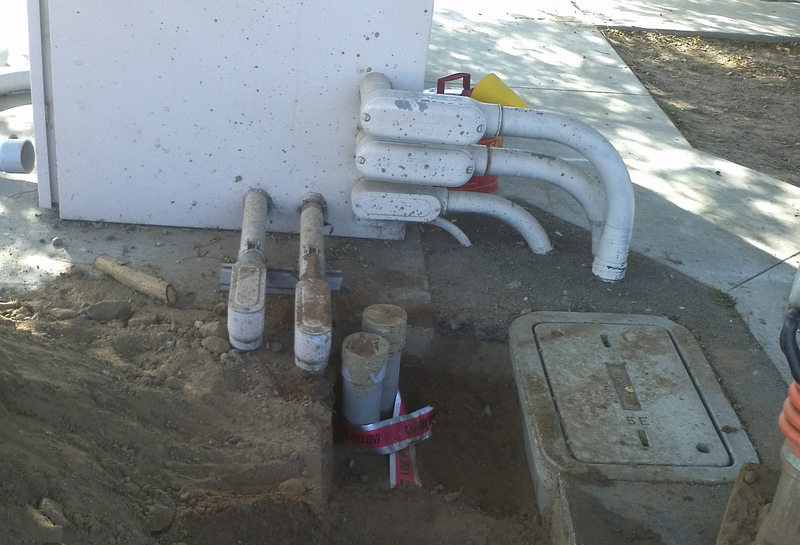 We can install conduit for more than electric Conduit. Can be for cable, fiber optic, electric, etc.